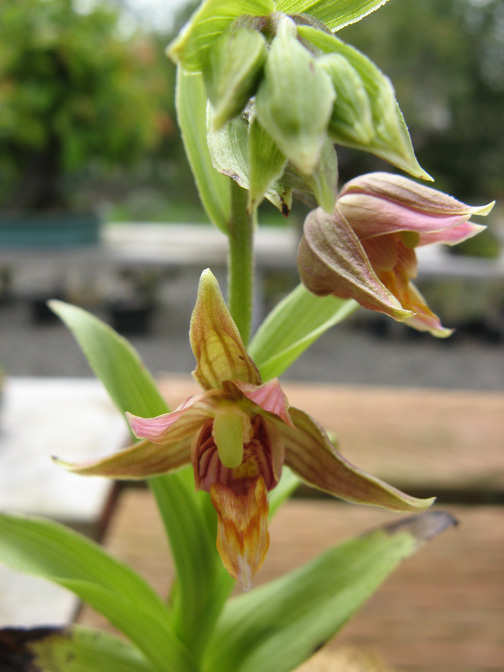 One of the Northwest native orchids, Giant Helleborine. In a pot it only reaches a few inches, and the flowers are about 3/4". Lives near rivers. Easy to grow. This accent came from a river. There was a large root mass that was attached to an exposed rock about five feet from the shore. It was early spring before the leaves were out and I could only recognize one of the plants, the orchid featured in the last photo, Giant Helleborine. The others looked like grasses of some sort. I used a saw, and sliced off a nobby portion of the root mass, like cutting a loaf of bread in half. This photo is from August, and well after the orchids bloomed. I discovered there were sedges and legumes and a small grass in there too. This Northwest fern is aptly called 'Licorice fern' as the rhizome, were you to chew on it, tastes like a stick of licorice. 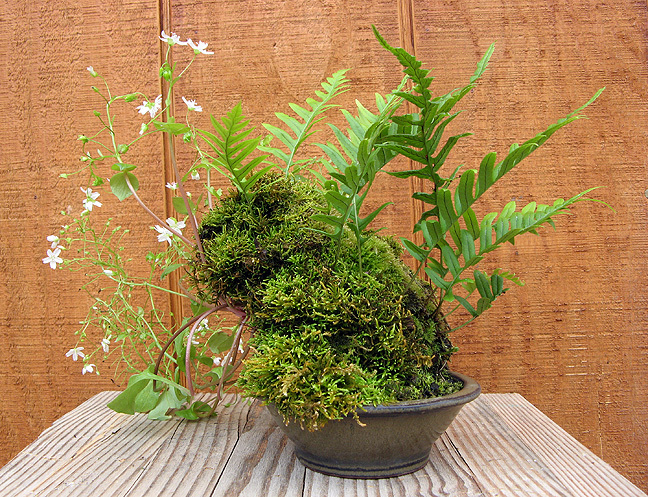 It is an odd and lovely fern, odd in the sense that the fronds grow in the spring, dry up and fall off in the summer, and then grow new again in the fall. I've had mine under mist all summer with curiosity whether I could cajole them into leafing out out of season, but they seem hardwired to only grow in spring and fall, oblivious of environmental coaxing. This one is growing on a chunk of bark and wood, separated with a saw from the stump it was on. I have no idea what the flowering plant is. Ideas, anyone? 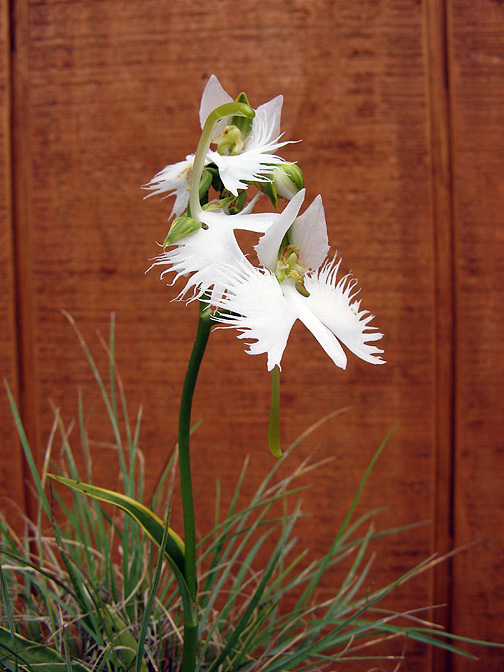 This is another terrestrial orchid, the Crane or White Egret orchid, Pecteilis radiata, from Asia. Its small 1" flowers bloom in August. The bulbs should be protected from hard freezes. 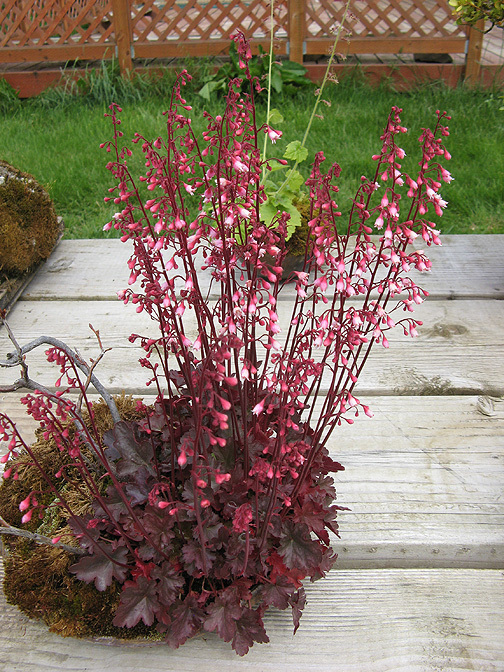 One of the Saxifrage family, Heuchera. 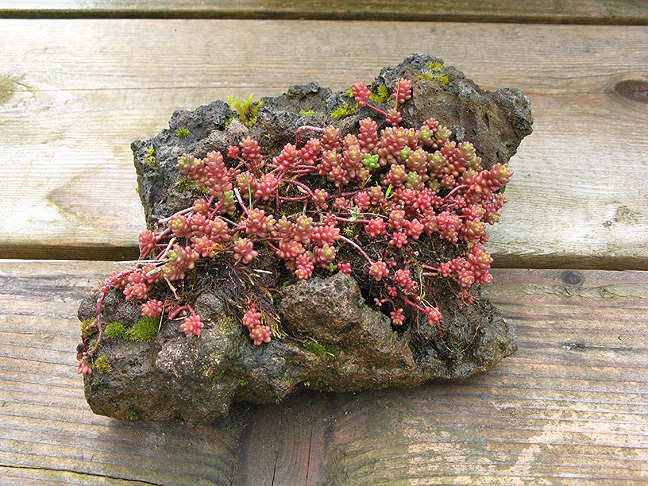 A stonecrop... on a stone. A dwarf Iris with one last bloom. These tend to be the equivalent for slugs to creme brulee, and I could never find the one that was happily nibbling on this one. Another Saxifrage. 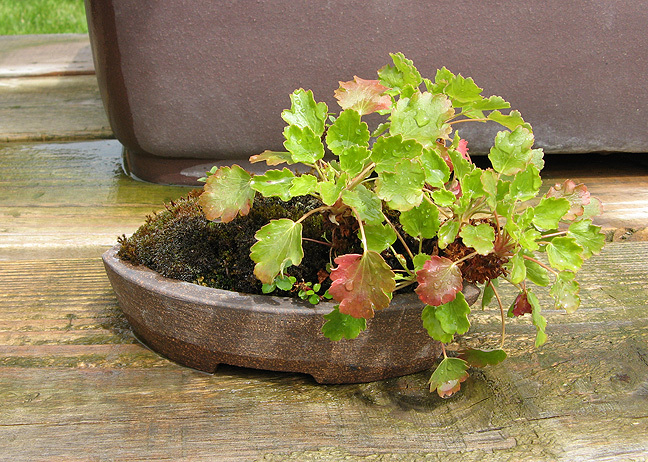 This in one of my old pots that I had designed as a 'boat' pot, but which I've since been corrected is an 'iron.' As in for ironing clothes. You can learn a lot from students if you listen up. Off in the hinterlands collecting trees, I came up empty-handed. 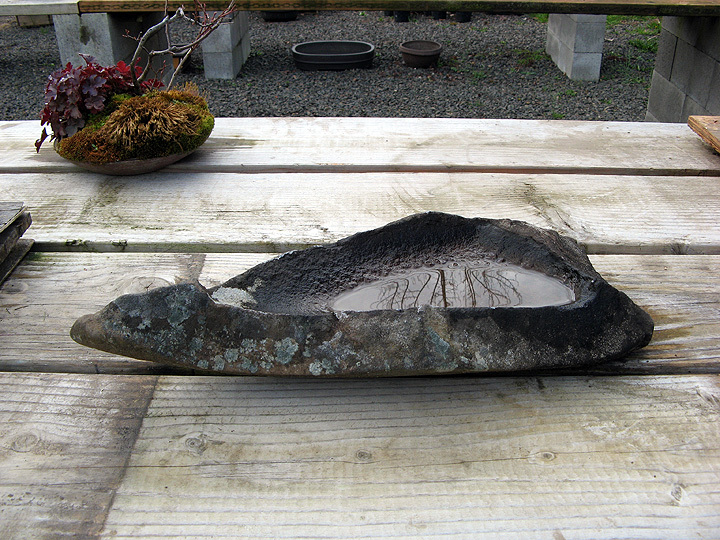 And then I found this water stone. A no tree day, but a one stone day. A good day. 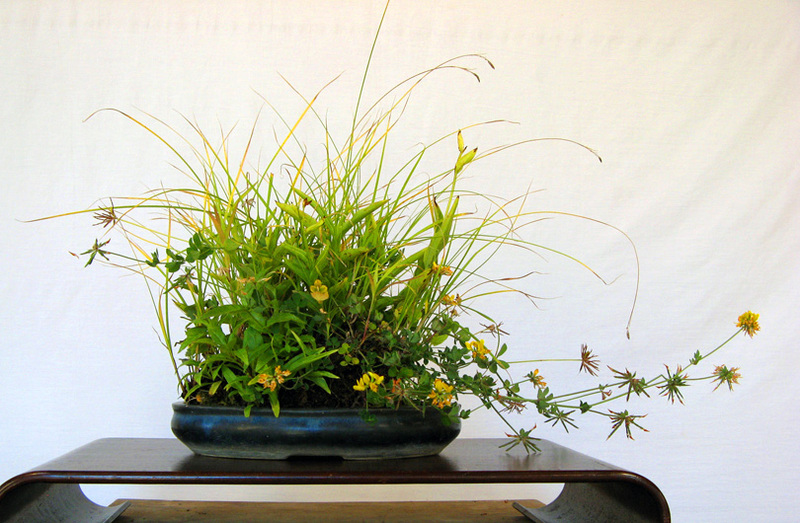 And this one is not really an accent although I have it out there between the bonsai along with the other accents. I could tell some story like 'Well, the boot never did fit.' But actually I bought it at an estate sale. 1. 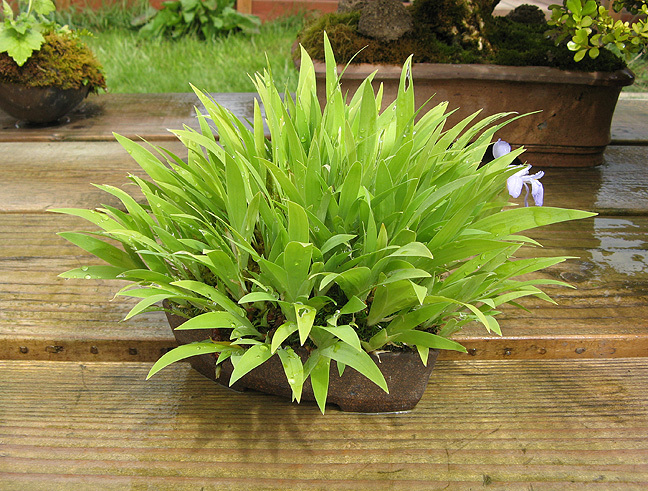 Would you ever show the Giant Helleborine with one of your trees and if so what type of tree do you think it would show well with? 2. Do you use your reg soil mix of 2 parts pumice & 1 part akadama for these companion plants? Yes, I think Giant Helleborine would do quite well as a companion to a tree like a mountain hemlock or a riparian tree like birch or alder. You don’t need to stick to trees that come from rivers around the Northwest, but it would be fun to do so and more meaningful. For companion plants I increase the akadama to 1/2 or even a bit more. Akadama is the water holding particle, and companion plants in general like a lot of water. 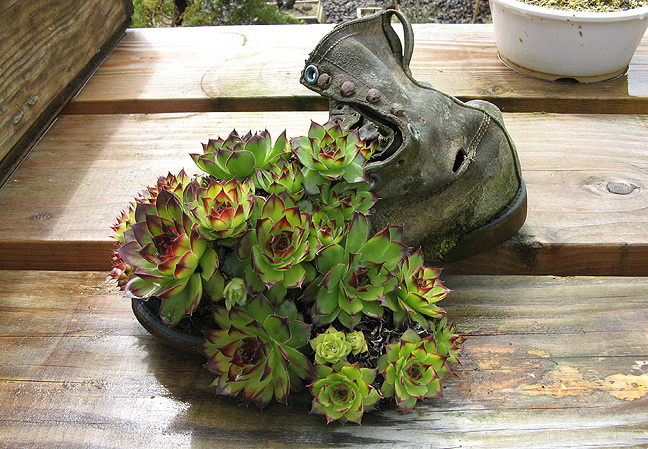 With some exceptions, like succulents which do better with less water.